Of course it is good to take a lot of pieces. But in real games in most of the cases we cannot take a piece for free and we have to think about making exchanges – taking one piece and giving up one of our own. The question is, which pieces are better to be taken and which can be give up? the rook is the most valuable (after the king), but it can be exchanged for two generals. Two light pieces can be exchanged for one general. Three pawns for one light piece is usually acceptable. Little hint for the future, pawns are more important than they seem. The importance of the piece is visible in the actual physical size of the piece! Check it with your shogi set. Now, knowing the values, let’s try to do solve new problems with special techniques. Always keep checking the piece value, so that you can understand why technique works. Answer: Pin means to make piece impossible to move. After moving the gold (6g, 6h, 4g, 4h squares possible), because of the lance attack both rook and bishop cannot move or you will take a piece for free. Even if they stay in same position, you can exchange the lance (3 points) for the bishop (8 points) with a huge benefit. Answer: Fork is basically simultaneous attack on two or more pieces same time. In this case, Knight to 5f square attacks (forks) both rook and the bishop. Whichever piece moves next turn, you can take other one with a benefit. Answer: Similarly to the previous problem, you can fork the rook and the bishop by moving the gold to 5e square. Problem 4 – the most scary fork, with a check! Answer: Silver to 3c creates double attack on the king and the rook. In this position the king must escape and you get the rook! (small comment) Later you will learn there is more than 1 answer here. In this case, the rook can take 2e pawn for free and make double attack on 2a knight and 7e silver. This technique is called “crossing rook” and often appears in real games. forks are made by pieces that can attack onto few sides (the rook, the bishop, the gold, the silver, the knight). You do not want to take the silver (5 points) with the rook (10 points), so there is nothing for you to gain. 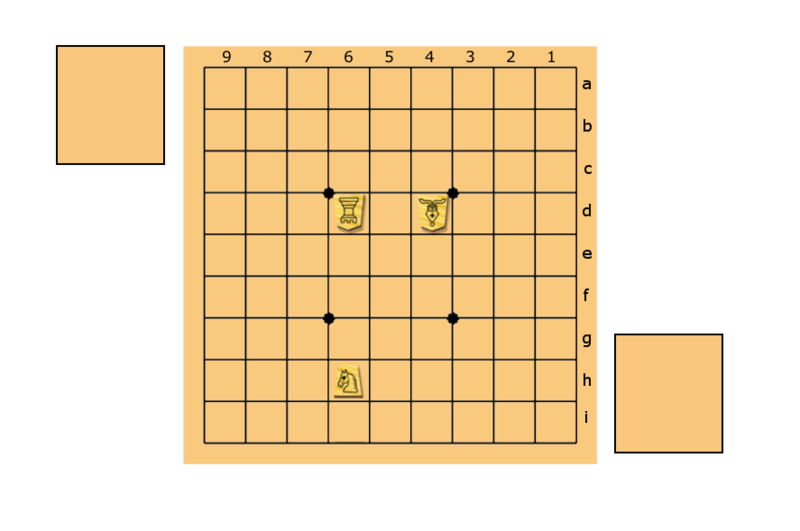 Now that you have a general idea how all the pieces move and how they can interact with each other, time to get to know two most exciting shogi rules: drops and promotion.